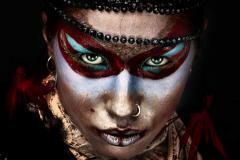 Face paint has been used as a means of expression almost since the beginning of mankind's existence. During ancient times, face paint was used for a variety of reasons, such as during a hunt, religious rituals or when going into battle. Today, face painting is used in dramatic performances, sporting events and at the county fair. When getting started in this ancient art, learn a bit about the history, as well as the practice. In ancient times, man used face paint in ritualistic ways to express his belief in the gods, nature, beauty and spiritual power, as well as to mark status and signify coming of age and fertility. Pigments were created from natural substances such as charcoal, ground minerals and plants and applied to the face and body with fingers and sticks. 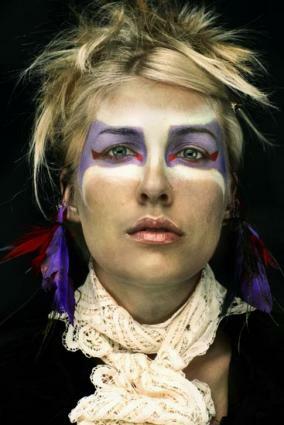 Today, face paint is largely used to create body art on facial skin and is a favorite at many festivals and art fairs. The art of body painting is also practiced by professional artists, many of whom participate in competitions around the world or work in the motion picture and theater industries. Although many artists will create body art with any type of non-toxic paints or markers, there is considerable debate over whether these substances should be used for face painting since they are formulated for use on paper and fabric, not human flesh. Actual face paint is a cosmetic grade substance approved for use on human skin and is generally the safest material to use when creating facial art. Cosmetic paints are typically available in palette, stick or crayon forms, although some paints are formulated for use with airbrushes. Water-based products tend to be more desirable than oil-based products because they can be applied more smoothly, generally cause less irritation and wash off much more easily. Henna, a natural plant dye, may also be used for body painting, but because the dye is able to last on the skin for weeks at a time, its use on facial skin is more limited. Here's a quick and easy recipe you can make at home. Add a few drops of water to thin the paint to the desired consistency. Glitter can be used to enhance a design, but the only glitter approved for face painting use is cosmetic grade polyester glitter in a size no larger than .008 microns. Metallic craft glitter should never be used because it can cause injury to delicate tissues. Whether you are the person applying or receiving face paint, understand certain precautions should be used to maintain health and safety for all concerned. In severe reactions, breathing may become difficult, so watch for any changes and if necessary wash off the product and contact a physician immediately for further directions. Sanitize your hands between each client. This stops the transfer of bacteria from one person to the next. If soap and water aren't handy, substitute liquid hand sanitizer. Look out for head lice. Holding a face with your free hand or brushing stray strands of hair back behind your client's ears is the perfect opportunity to pick up head lice under your fingernails. If you wear colored polish, you may be completely unaware of your little hitchhiker, and if you happen to smooth back your own hair, you now become his next host. Try to give your client a visual check around the hairline and face for any obvious signs of infestation and ask the child or parents to hold hair back out of the way while you paint. Avoid painting areas with skin infections or irritations and/or open wounds. This includes conditions such as acne, rosacea, seborrhea, psoriasis, cold sores, cuts and scrapes. Not only can bacteria be transferred to others, face paint can irritate the affected skin even more. Use great caution when painting around the eyes. 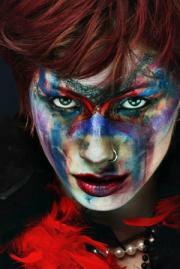 Not all facial paints are meant to be used on delicate eye tissues, so read all labels and directions carefully. It's a good general rule of thumb to avoid painting near children's eyes, since they tend to rub them and could transfer the paint into their eyes, causing irritation or injury. Arrive at the session with clean skin. Observe the painter at work to make sure he/she is washing between clients and not reusing uncleaned brushes and sponges from one person to the next. Parents will need to check these things on their children's behalf. Remove face paint before going to bed at night to avoid skin irritation. Paint can also get rubbed into the eye area or stain pillow cases, so it's always a good idea to wash it off. Depending on the venue, face painters can work for hours at a time; have your work station setup comfortably to avoid muscle injury and exhaustion. Organize your workspace for optimum use. Have all your tools and materials within easy reach and a trash bin close at hand. Use chairs. Chairs provide stability for both you and your client, making it easier to paint with a steady hand. A chair also prevents you from standing bent over for hours on end, which could lead to a back injury. Once you know the basics, there is nothing standing in your way from getting involved in the world of face painting. While the results are not as permanent as a tattoo or a piercing, they can be no less dramatic and striking. Indeed, sometimes they can be even more so.